Get warmth and coverage for cool-weather runs, with a good range of motion and a flattering fit. 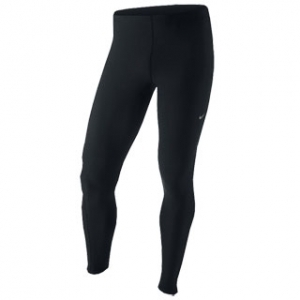 These Nike Essential Running Tights are designed for premium comfort, and use Dri-FIT stretch wicking fabric to keep you comfortable without restricting movement. The seams are flat stitched and positioned to reduce chafing and the knees are slightly articulated so you can take your natural stride pattern. The close fit gives support and ensures the tights don't get in the way, allowing you to just concentrate on beating your PB. Ankle zips make it easy to get them on and off over trainers. Dri-FIT fabric dries quickly, and actively moves perspiration away from the skin where it can evaporate so you don't feel clammy or overheat. The waist has an elasticated drawcord for a more personal fit, and a zip pocket on the back that can hold a key or MP3 player. Whether at the gym, on the road or hitting the trail, the Nike Essential Tights give you the freedom to run how YOU want to.